Perfect Connextion swing trainer dramatically transforms the way your golf swing looks, feels and performs. It builds learning and feeling, effortless strength for creating an easy, repeatable swing with control, accuracy, and power It teaches swing awareness, good posture and easy, graceful movement. Perfect Connextion swing trainer improves flexibility, agility and economy of motion. It can even help alleviate back pain. Top athletes use it for strength, flexibility, and power. Developed from the Anatomical-Kinetic techniques of Carl Rabito, "Structure governs function," Perfect Connextion swing trainer is a safe, sensible interactive development product using your own clubs, that will help you know and feel your very best golf. No matter what your age or condition, it will work for you. The stabilizer bar easily adjusts to from the specific Power Triangle for full swing, chips/bunker and putting. Perfect Connextion swing trainer gets your swing connected with your body. By emphasizing proper connection, correct spinal and joint alignment, and complete concentration on smooth, flowing movement, you become acutely aware of how your swing feels, where it is in space, and how to control its movement. Proper set up is essential, and helps you execute movements with maximum power and efficiency. Last but not least, learning to move properly can reduce stress. Perfect Connextion swing trainer is the only equipment that automatically provides these desired results. With Perfect Connextion swing trainer you AUTOMATICALLY form the Power Triangle-the absolute center to every swing in golf (full swing, chip & putt). Swing aids talk to the brain. Perfect Connextion swing trainer talks to the mind of the body-FEEL. Feel is the fastest path to learning. It can't be taught. It can only be learned. It can only be learned by physical experience. Perfect Connextion swing trainer gives you that physical experience. You learn for yourself by feeling and seeing for yourself what's right. Once you learn that powerful trust of right, you'll never go wrong again. You own it! You'll be better for good! 5. Develop a strong swing - big muscles connected to the small muscles, "The Power Traingle"
Building on the principles of www.rabitogolf.com Perfect Connextion swing trainer drills develop a strong "core," or "Power Triangle" The absolute core to all golf swings. The core consists of the big muscles connected with the small muscles. Control of the core is achieved by connecting the trunk and shoulders while properly engaging the 6 major joints and spine in a proper kinetic sequence. In conventional swings, weak small muscles tend to dominate and strong muscles tend to be left behind. The result is kinetic imbalance - a primary cause of injury, chronic back pain, and swing inconsistencies. Perfect Connextion swing trainer conditions the whole body, even the ankles and feet. No muscle group is over trained or under trained. Your entire skeletal anatomy is evenly balanced and conditioned, helping you enjoy golf with greater ease and less chance of injury. Perfect Connextion swing trainer trains several muscle/joint groups at once in smooth, continuous movements. By developing proper technique, you can actually re-train your body to move in safer, more efficient patterns of motion - invaluable for optimal golf. No other swing trainer is so gentle to your body while giving it a challenging swing workout. No other swing trainer provides learning for all 3 golf swings. The drills are performed with your own clubs, allowing for (x1) full swings, (x2) chips, and (x3) putts. Perfect Connextion swing trainer can be used during play (x1), at the range (x2), or at home (x3), with or without a ball. Perfect Connextion swing trainer is an extremely flexible learning system. Modifications to the drills allow for a range of difficulty ranging from beginning to advanced. It also is a personal report card for what you are doing right or wrong. Get the learning that best suits you now, and increase the intensity as your golf swing improves. The more you use Perfect Connextion swing trainer, the more feel feedback you get and the faster and deeper your learning. This is learning that will never leave you. You'll be better for good! What would that feel like? The Perfect Connextion is the essential link between learning and feeling the core of the Perfect golf swing - The Power Triangle! This three-in-one swing trainer automatically helps the golfer form and maintain The Power Triangle - the absolute core to every stroke in golf - full swing, chipping and putting. HOW DOES PERFECT CONNEXTION WORK? The Perfect Connextion automatically connects your big muscles to consistently swing the club in rhythm with your body—maximizing your power, control and accuracy for all swings. * Feel the connextion of your shoulders, arms, and chest as you rotate your backswing. * Reinforce the proper right elbow position at the top of your swing; keeping the club stable. * Prevent over swinging, which encourages a proper forward swing sequence. * Improve your swing by creating a repeatable and sound swing, thus a repeatable motion. 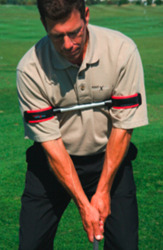 * Eliminates the slice swing by keeping your arms connected and in synch with your body. * Prevents a short arm or chicken wing stroke. * Enhances proper swing balance by allowing your left and right arms to fold correctly in the follow through, encouraging a full-finish. * Eliminate swing demons by teaching you to generate repeatable swings that will automatically remain steady—even under pressure. If you lose that "loving feeling" simply pull the Perfect Connextion out of your bag and take some practice swings to regain that feeling. The three-in-one swing trainer automatically helps you form The Power Triangle—the absolute core to every stroke in golf—full swing, chipping and putting. WHY DOES PERFECT CONNEXTION WORK? You learn for yourself by feeling and seeing for yourself what's right. This instant feedback develops physical memory. WHAT MAKES PERFECT CONNEXTION DIFFERENT THAN OTHER SWING AIDS? The Perfect Connextion is NOT an aid or trainer! It is a piece of equipment kinetically and biomechanically designed to automatically provide and maintain the proper swing mechanics (The Power Triangle) with a built-in self check mechanism. It is portable, convenient, and usable with ALL clubs, ALL swings, ALL ages while playing or practicing. Simple: The Perfect Connextion defines disconnected and redefines connected. With it you automatically form The Power Triangle; the absolute core to every stroke in golf—full swing, chipping or putting. That's the power X3 to improve. Fast: This is a learning aid, not a teaching aid. Teaching aids talk to the brain. Perfect Connextion talks to the mind of the body-feel. Feel is the fastest path to learning. It can't be taught. It can only be learned from physical experience. Unforgettable: Perfect Connextion gives you that physical experience. You learn for yourself by feeling for yourself what's right. Once you learn that powerful feeling of right you'll never go wrong again. You own it. You'll be better for good. WHERE CAN PERFECT CONNEXTION BE USED? It can be used during play, at home or at the range - with or without a ball. The Perfect Connextion does help with every club in your bag, and with all different types of shots. WHO CAN BENEFIT FROM PERFECT CONNEXTION? IS IT FOR ME? Fair golfers will learn faster-good golfers will improve faster-better golfers will advance faster. Whether your full swing needs better distance and consistency; your chips need better control and accuracy or your putts need better line and speed. Everyone and every swing will benefit from Perfect Connextion - guaranteed! With the Perfect Connextion you will automatically form The Power Triangle; the absolute core to every stroke in golf - full swing, chipping or putting. That's why it gives the power to improve X3. WHEN WILL I KNOW PERFECT CONNEXTION WORKS? One feel is worth a thousand words You'll feel what it's like to be connected with Perfect technique like the Pros. And once connected you will have the physical memory to play a better game - guaranteed! If you have any questions about this product or would like to order by phone, please call us Toll Free at 888-733-8383. We look forward to hearing from you! If you have any questions regarding the Perfect Connextion Golf Swing Trainer, please give us a call, we would be happy to help you with any questions you may have. Write an online review on the Perfect Connextion Golf Swing Trainer, and share your thoughts with others.